Automatic Calibration & Automatic Temperature Compensation Functions are built in. 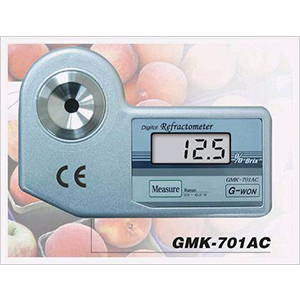 Therefore, you don’t need to do calibration every time when you check out the sweetness content in all kinds of foods including fruits, jams & etc. unlikely other companies’ products. All you have to do is just push “Meas.” button with your finger. Drip a few drops of test sample on the ‘Sample Well’. Place ‘Light Cover’ on the sample well, and press ‘Meas.’ button. After(-) sign flickers three times, measurement result(Brix %) appears on LCD in two seconds. If the test sample is out of measuring ranges, “Err” Sign appears.